If you are stuck for January publicity ideas I’ve collected a whole bunch of them together for you. January is the start of the new year and all our good intentions to promote our websites by blogging and tweeting regularly. It’s easy to draw a blank with planning though, so here are my own personal ideas drawn out as a mind map. 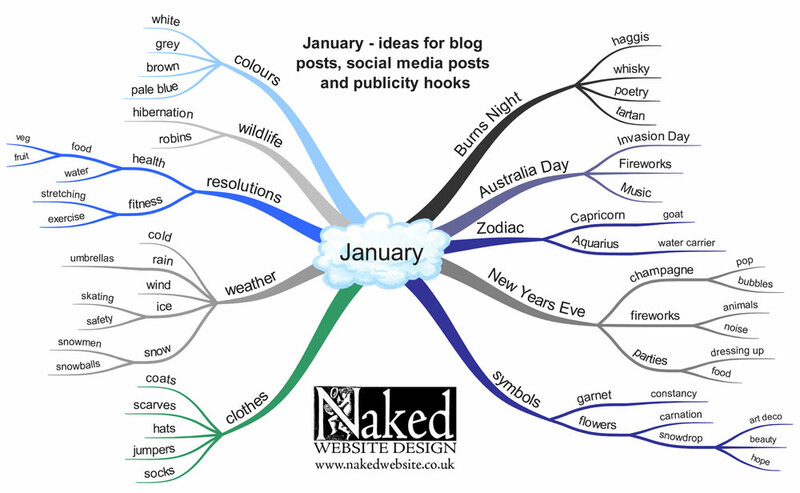 It’s not an extensive list, the idea is that is sparks a little bit of inspiration for topics that links in with January. You might want to run a special seasonal offer or promote your website with images through Pinterest and Instagram. I’ve researched and listed major events, colours, wildlife and symbols associated with the first month of the year. It is a mind map of my personal ideas, some of them might not work for you, some might give you further ideas. Think of it as a springboard! Chinese New Year might fall in January too.